Michele D. Hall, a second year Harvard law student, explained on Blavity.com, “The portraits of black professors, the ones that bring me and so many other black students feelings of pride and promise, were defaced. Their faces were covered with a single piece of black tape, crossing them out of Harvard Law School’s legacy of legal scholarship. 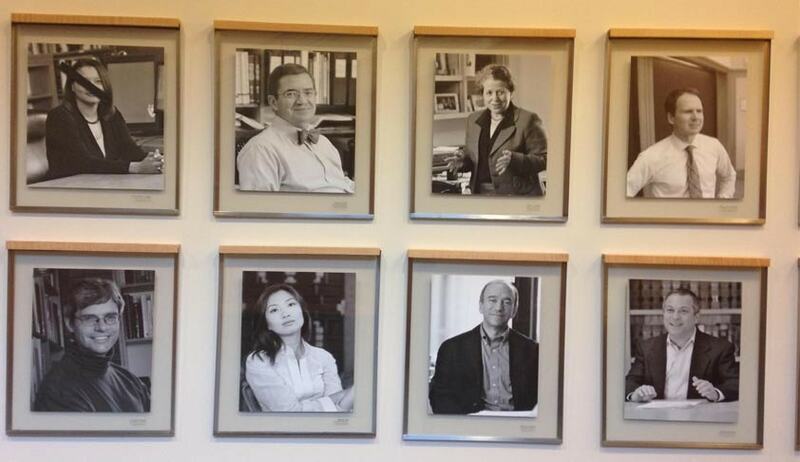 Their faces were slashed through, X-ing them out, marking them as maybe unwanted or maybe unworthy or maybe simply too antithetical to the legacy of white supremacy on which Harvard Law School has been built.” The tape has since been removed, replaced by Post-it notes with positive statements about the professors. Harvard Law School Dean, Martha Minow was quoted as saying that the incident is being investigated as ‘hate crime’. However, the officials are not sure about a connection between the defacement and a rally supporting black students across the country, that had been organized a day before. The defacement is not an isolated incident. Harvard Law Students have been mounting a charge against the school’s crest. The emblem is taken from the Royall family, whose scion Isaac Royall Jr. endowed its first law professorship. The Royalls were also major slaveholders on Antigua, profiting handsomely from it before moving to the North American colonies, bringing some slaves with them. According to a statement from Royall Must Fall, the group campaigning against the seal, black gaffer tape had been placed over the seal around Wasserstein Hall on Wednesday night. They claim that this tape was removed and placed on the faculty pictures. Protests against systematic racism at colleges have been witnessed in several prestigious colleges across the nation. Students of Yale University had even called for resignation of administration members who have been criticized for creating a dangerous environment. At Columbia University, activist group Students against Mass Incarceration, in conjunction with Black Lives Matter, succeeded this summer in convincing the university to divest from private prisons. At Georgetown University in Washington, D.C., a demonstration in solidarity with Yale and Mizzou led to the renaming of two buildings on campus that canonized slave owners. Despite the outrage, the protests have sparked an equal amount of opposition as well. Former Harvard Law professor and leading proponent of civil liberties, Alan Dershowitz, has called the student protesters “tyrannical” and hypocritical in their demands. “They may want superficial diversity, because for them diversity is a code word for ‘more of us.’ They don’t want more conservatives, they don’t want more white students, they don’t want more heterosexuals,” he told Business Insider.